Play a game of word association and ‘Greece’ will probably be the word most associated with island hopping. But I’d argue that Scotland should come a close second – it also has white beaches, beautiful coves, and turquoise blue sea. Okay, maybe the weather is not quite as good as Greece but it does have more distilleries…. 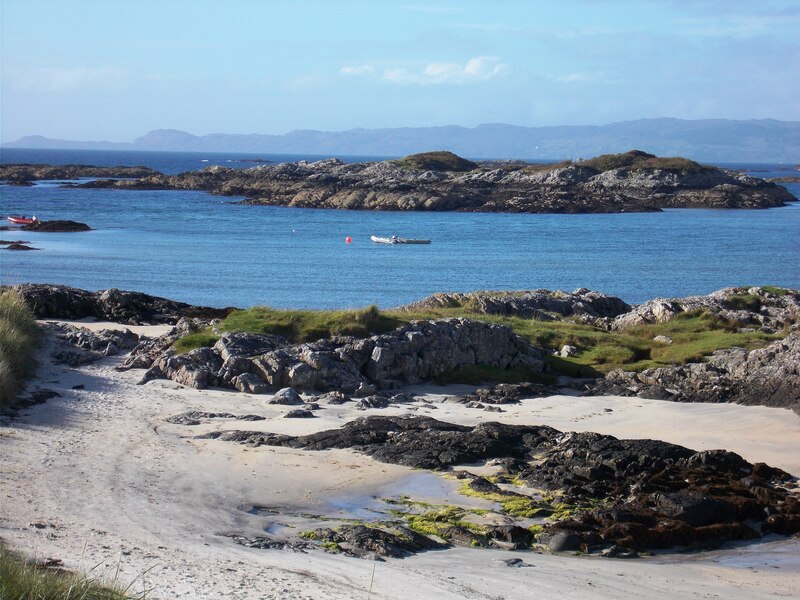 Taking advantage of the good weather in September, I did a short trip up the west coast of Scotland starting on the Isle of Arran and finishing on Skye, taking in the islands of Islay, Jura and Mull on the way as well as the wonderful Ardnamurchan peninsula and Arisaig. 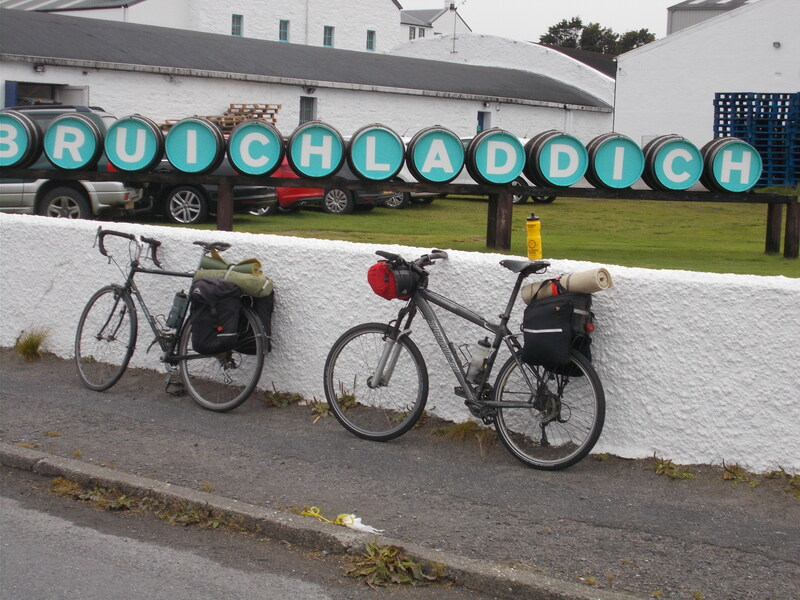 It was a trip of 5 islands, 8 ferries and 12 distilleries. 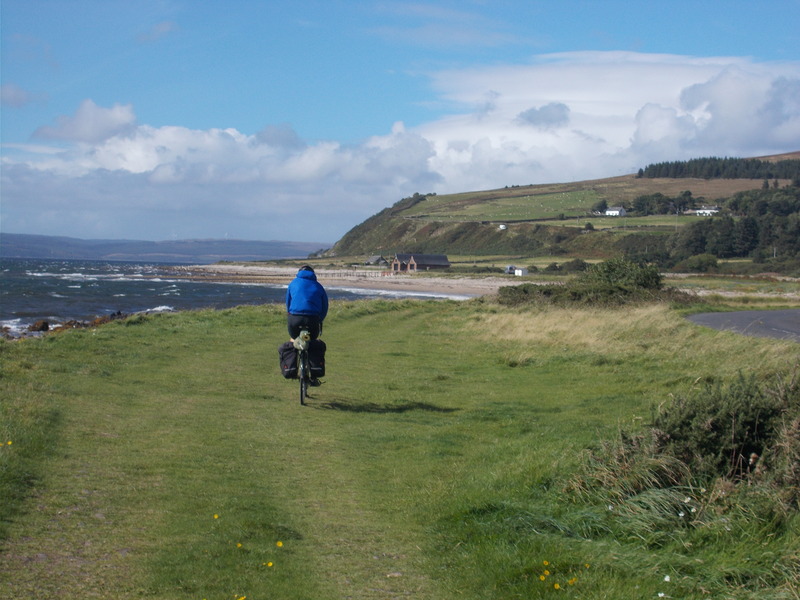 After taking the ferry from Ardrossan to Brodick in Arran we started the trip with a clockwise circuit of the island and camped at Lochranza in the north. From Lochranza it’s a quick ferry hop to Kintyre and then a short ride to Kennacraig for the ferry to Islay. 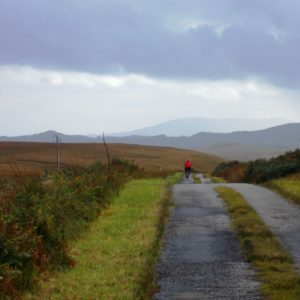 Riding across Islay is like looking at the whisky shelf in your favourite bar – all those famous names keep appearing out of the mist so there’s plenty of diversions as they all offer tours and tastings. Islay was wet and windy but we resisted the temptation and just kept going, roding fairly directly from Port Ellen, through Bowmore to Port Charlotte. On to Port Askaig and the ferry to Jura. 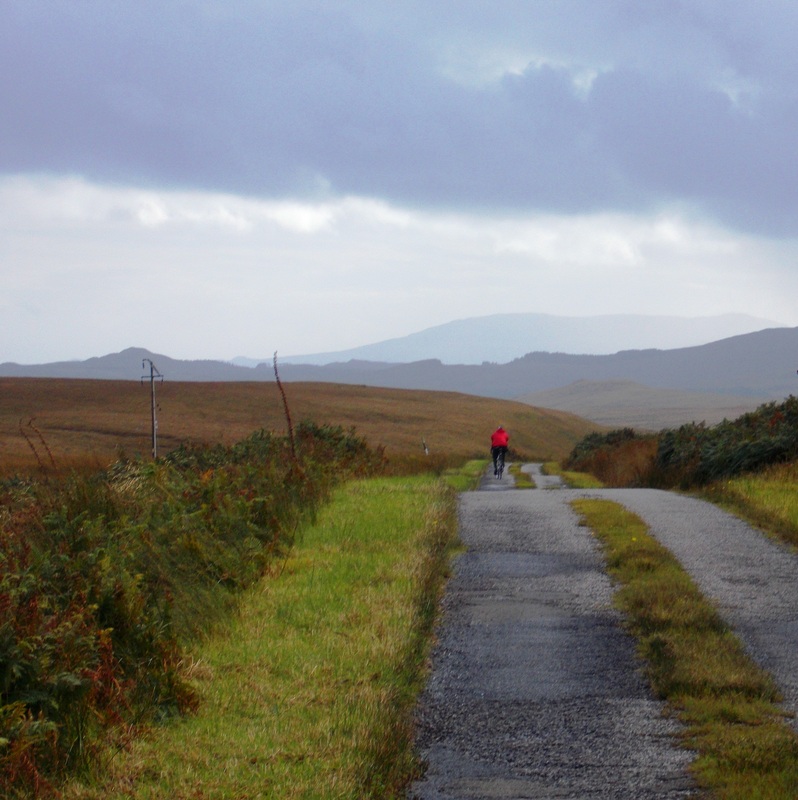 There is only one road on Jura and it is worth riding every bit of its 40km, even though you’ll have to return along it. 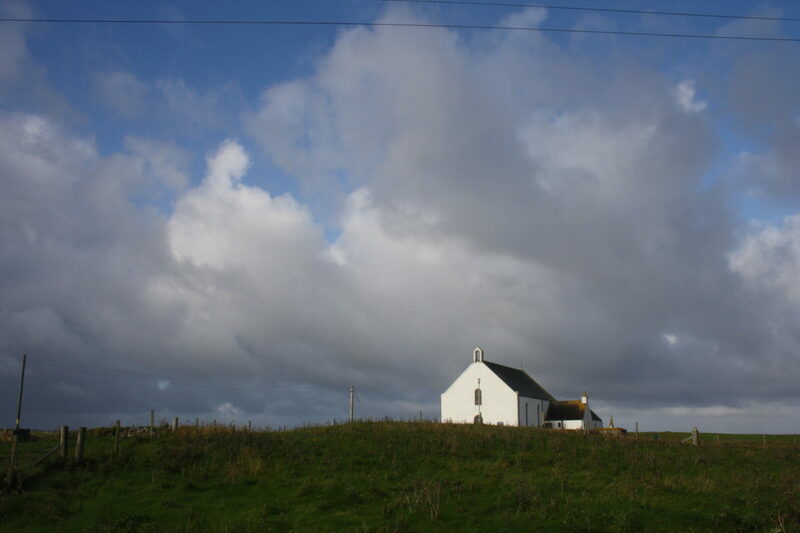 It dips and weaves across the moors, along the shoreline, through woodland, past remote farms with alternating views of the wild hills and the Sound of Jura. 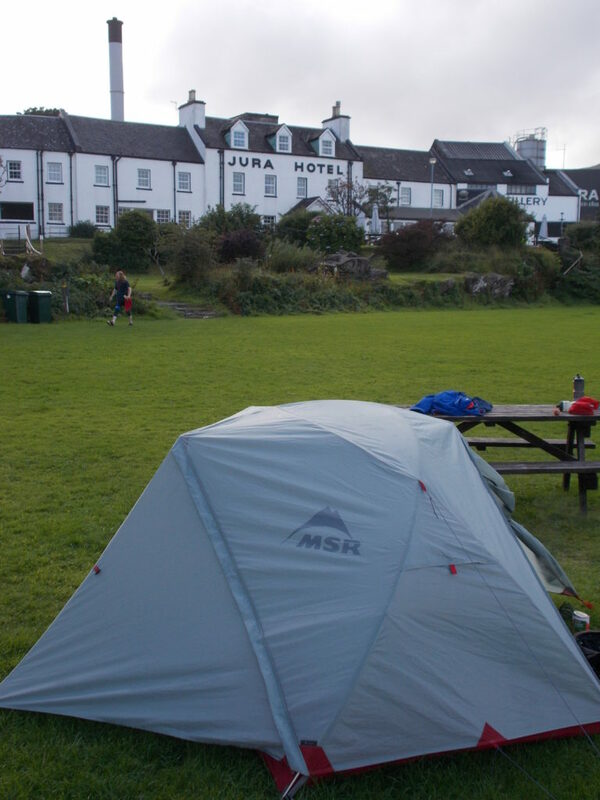 The main/only village on Jura is Craighouse and it has a perfect campsite on the front lawn of the Jura Hotel overlooking the bay. If you get your timing right, you can take the ferry from Port Askaig to Oban (it only goes twice a week) and then catch another ferry to Craignure on Mull. 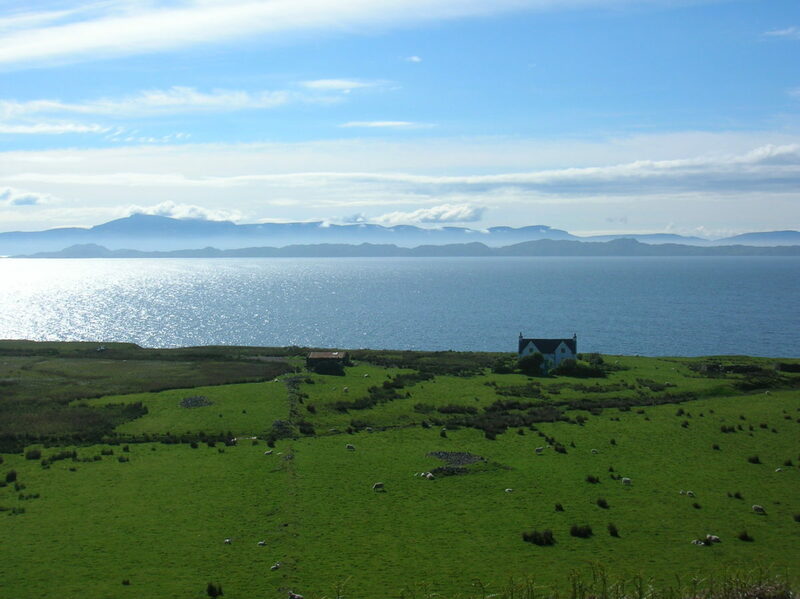 From Craignure we headed to Salen and then crossed to the west coast of Mull which gives great scenery but some tough climbs through Calgary and Dervaig to Tobermory (campsite 2 km before the village and hostel in the village). 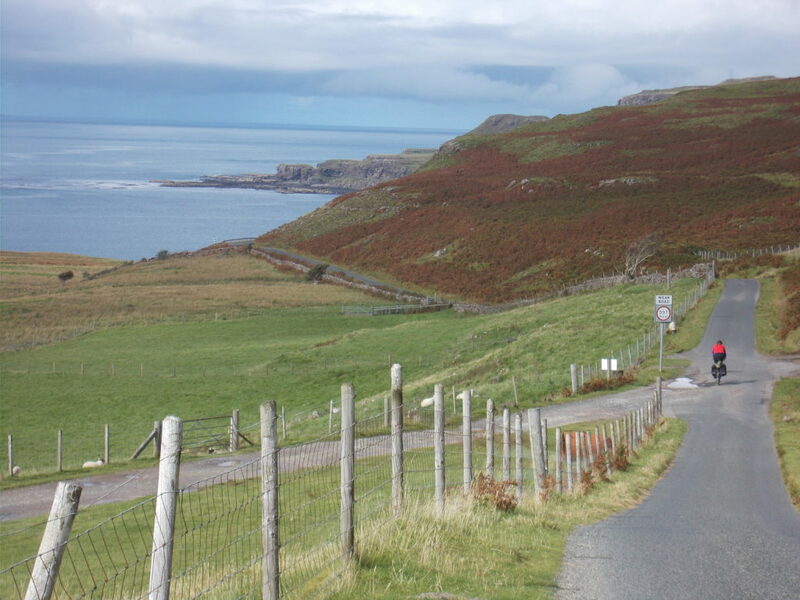 From here we took the ferry to Kilchoan on the Ardnamurchan peninsula. At Kilchoan there is the option of turning left and heading to the most westerly point of Britain – Ardnamurchan Point – it’s an out and back ride. From Kilchoran a switchback ride first climbs over the moors and then along the empty undulating road along the wooded banks of Loch Sunart to Salen (another one!) before heading north to Lochailort. If you’ve got time there are plenty of side roads you can take to deserted beaches. 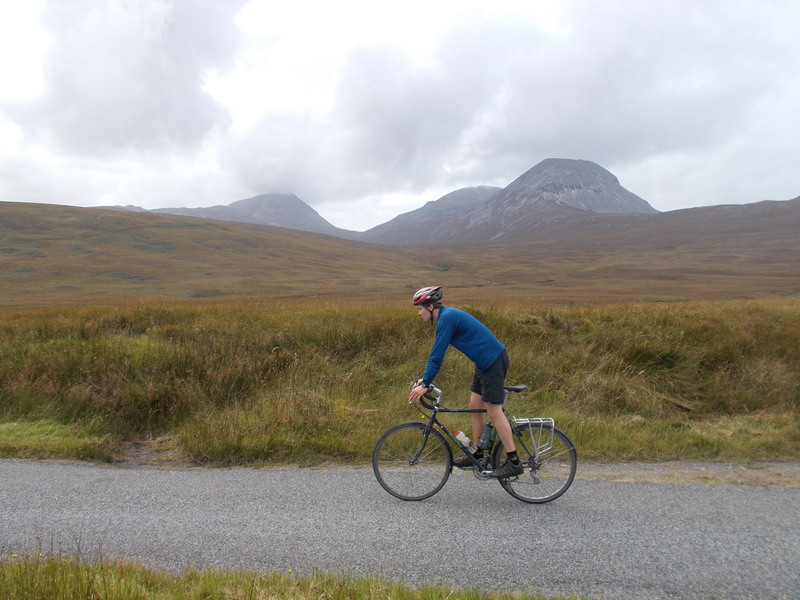 From Lochailort there’s 15km of riding on the main road before you’re back on minor roads to Arisaig. 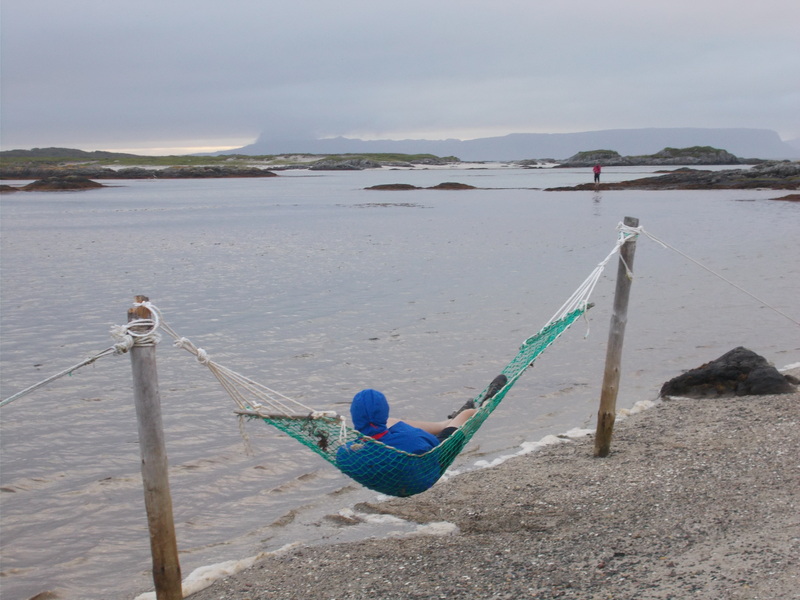 The Sound of Arisaig is dotted with white sand beaches, rocky inlets and has a backdrop of the mountainous islands of Rhum and Eigg – to complete the idyllic setting we even found a hammock on a beach! 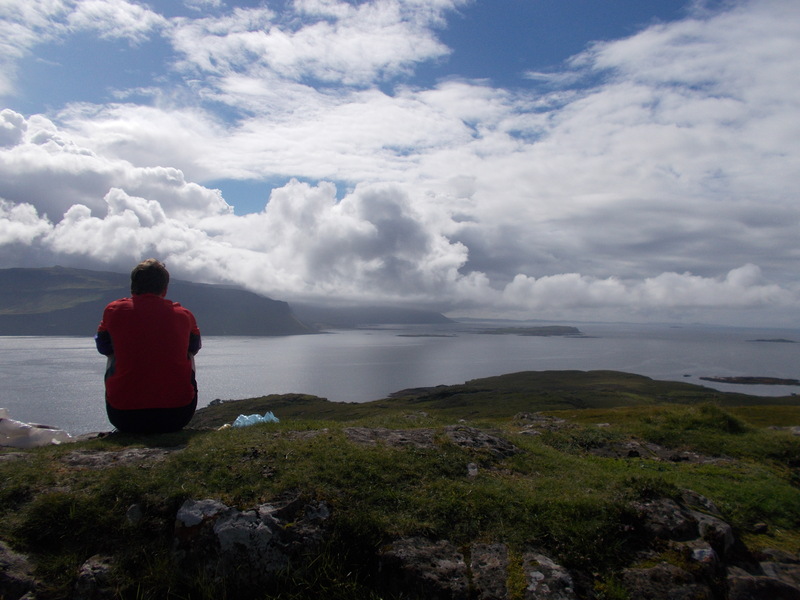 On our final day we took the ferry from Mallaig to Armadale on Skye and had a quick half day tour of the Sleat peninsular before returning to Mallaig for the train to Glasgow – a slow, meandering train journey across the Highlands to complete an equally beautiful and meandering ride. 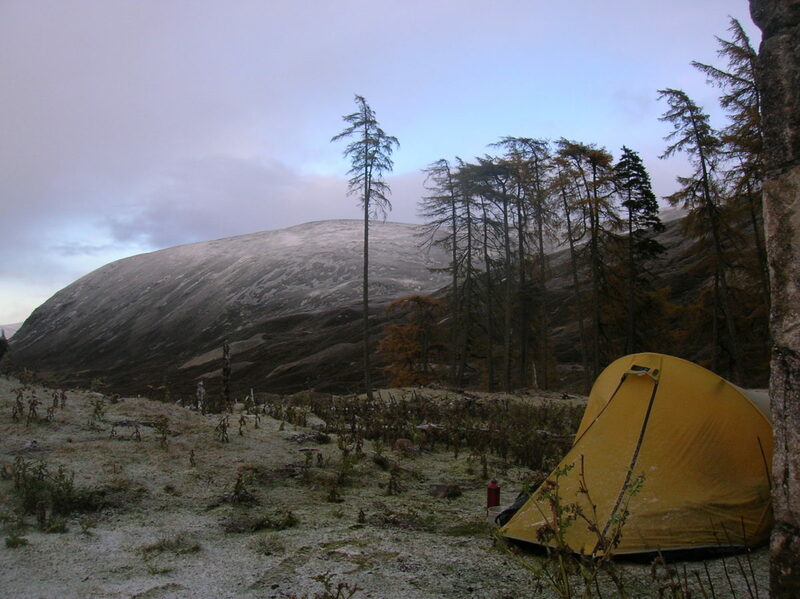 There are endless variants on this short tour – I’ll add a page soon to the UK section of the website with all the practical stuff on travel, campsites etc. Excellent. Great scenery. Knowing all the distances and where to sleep would be cool.